WASHINGTON, D.C. -- Americans' views of each of the four leaders of the House of Representatives and Senate continue to be more negative than positive. The two House leaders remain better known nationally than the two Senate leaders. 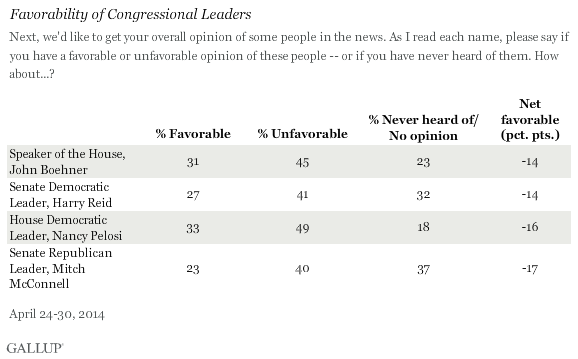 These are the results of an April 24-30 Gallup survey, which also shows that many Americans report they have never heard of or have no opinion of the congressional leaders. John Boehner, who has served as the Republican leader of the House since 2006 and became speaker in 2011, enjoyed generally positive and neutral net favorability ratings between 2009 and 2011. 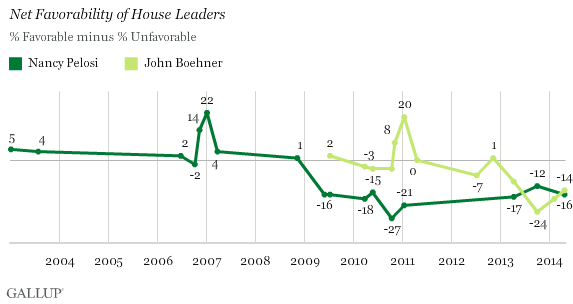 His highest net favorable rating was in January 2011 when he became speaker, but fell later that same year. His rating has recovered somewhat from its lowest point during the government shutdown in late 2013, when Americans' unfavorable opinions of him outweighed favorable attitudes by 24 points. Americans' views of Democratic leader Nancy Pelosi, who served as speaker from 2007 to 2011, remained mostly positive through 2008. She also enjoyed a surge in positivity in early 2007 when she became speaker. Since 2009, however, her unfavorable ratings have consistently overshadowed her favorable ratings by at least 12 points. Democratic leader Harry Reid's net favorable now stands at -14, off its peak of +8 in 2006. Reid has not received a positive net favorable since 2007. Republican Mitch McConnell's net favorable is slightly worse at -17. Gallup has yet to measure a net positive score for McConnell since first asking about him in March 2010. The Tea Party continues to be an important component of the Republican Party, although its support has been dwindling. With its anti-establishment rhetoric and positioning, members of Congress aligned with the Tea Party have, at times, been at odds with the GOP leadership. Despite this, Republican leaders Boehner and McConnell get more positive ratings among self-identified Republicans who support the Tea Party than they garner among Republicans who do not. 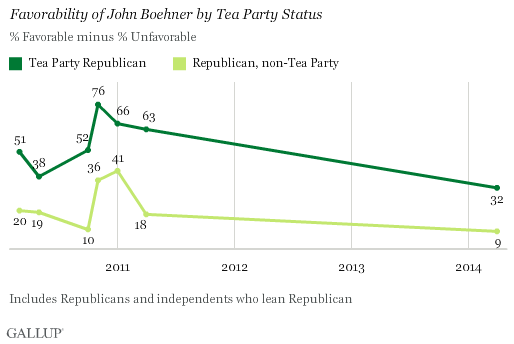 Boehner currently has a net favorability rating of +32 among Republican supporters of the Tea Party, compared with a score of +9 among Republicans who do not support the Tea Party. Since 2010, Republican Tea Party supporters have consistently expressed more positive attitudes toward Boehner than non-Tea Party Republicans have. The gap between them is now 23 percentage points separating the groups' attitudes, down from a widest difference of 45 points in 2011. 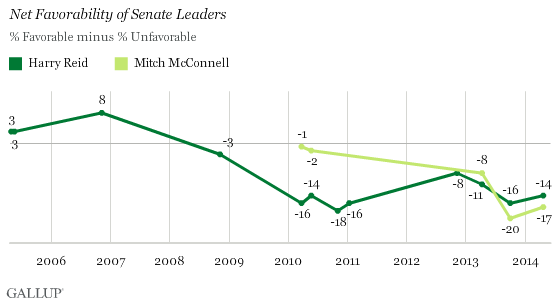 A similar pattern holds for Republicans' support of McConnell. 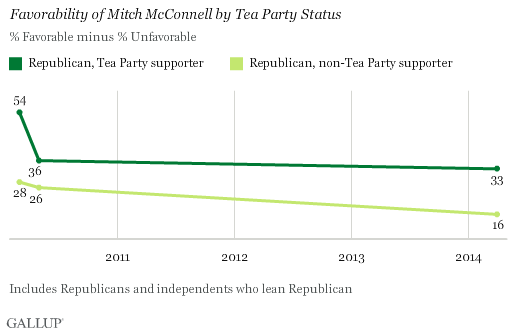 Since 2010, Republicans who are Tea Party supporters have reported higher net favorability of McConnell, compared with non-Tea Party supporters. As previous Gallup research shows, the Tea Party draws much of its support from Americans who are similar ideologically to traditional Republicans, whereas non-Tea Party Republicans are more likely to identify as liberal or moderate. This could explain the higher levels of support for Republican leadership among Tea Party supporters, despite the historical tensions between the Tea Party and the Republican establishment. The current media narrative suggests Tea Party voters could be trouble for establishment candidates. These findings, however, suggest that Boehner's defeat of two Tea Party challengers in the Ohio Republican primary may have been at least partly attributable to his favorable image among Tea Party voters nationwide. Further, there is evidence that the gap in opinions between Tea Party Republicans and Republican non-Tea Party supporters may be shrinking. McConnell receives higher net favorable ratings among Tea Party Republicans than among Republicans who do not support the Tea Party. This could be a positive sign for McConnell, who faces a Tea Party challenger in the Kentucky Republican primary on May 20. However, the Republican leader of the Senate remains relatively obscure to most Americans. Michelle Obama maintains a 66% favorable rating, similar to her past ratings. Her average favorable rating so far is higher than Hillary Clinton's during her time as first lady, but lower than Laura Bush's.